I have to thank my mentor for sending me this book as a Christmas gift, because she clearly knows me well. As an avid reader and former English tutor, I’ve had a reputation as a Grammar Nazi for most of my life, but Between You and Me showed me that “Comma Queen” is a much better label. This memoir/writing style guide was written by Mary Norris, who has worked in the copy department at the New Yorker since 1978. She details her professional experiences of what it has been like to work at this major publication for decades, watching as English spelling and grammar changed before her very eyes. At the practical level, this book is an excellent refresher of those lessons you may have forgotten since your school days. She explains how to use commas and when to use who vs. whom. English majors will love all the literary references, such as Emily Dickinson’s penchant for hyphens in her poetry. However, these lessons become more frequent as the book goes on, and I felt that Norris could have included more confessions instead. So, yes, while this book can get a bit pedantic at times, Norris has a wonderful sense of humor and is not nearly as judgmental about copyediting as you might think. Experience and wisdom has softened her, and she continually recognizes even her own ignorance. Although I wished that Between You and Me contained more anecdotes, I thought it was an amusing look into one copyeditor’s point of view. 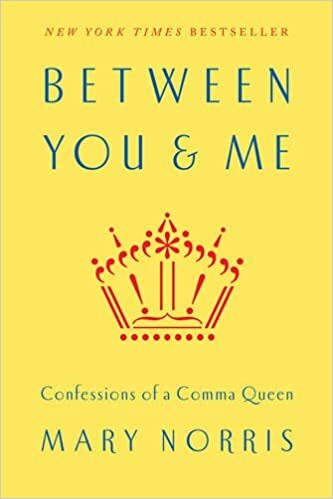 Everyone knows a Comma Queen, so treat them to this book like I was! This entry was posted in Book Review and tagged Between You and Me, book review, copyediting, Grammar, Grammar Nazi, Mary Norris by Book Club Babe. Bookmark the permalink. I’m intrigued by the mention of a museum full of pencil sharpeners. Where is this?! I can’t recall the chapter, but she mentions her love of #1 pencils and sharpeners, so much that she made a special trip to a pencil sharpener museum in Ohio! That’s really funny, but I won’t pretend that I wouldn’t go to such a museum if I were in the area.